Pet laser therapy is only one aspect of the multimodal approach to pain management at our veterinary hospital. As an adjunct to medical protocols, laser therapy is helpful in reducing pain and inflammation, and in accelerating the healing process after surgery and dental procedures. Patients with a wide variety of acute problems benefit from Class IV laser therapy. How do you know if your pet is in pain? 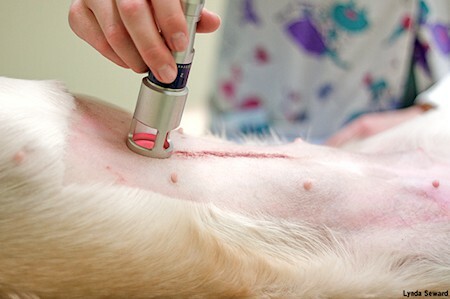 Laser therapy treatment is safe, painless and fast. It is advised however, that patients with cancer do not undergo laser therapy. A typical treatment is around 8 minutes, depending on the number and size of the affected area(s). After the initial assessment, if some acute problems are present, then the patient is treated daily. More chronic problems respond better to treatments that are given 2 to 3 times a week, tapering to once every week or two as improvement is seen. The number of treatments needed is dependent on the nature of the problem. For some acute conditions, 1-2 treatments may be sufficient. Those of a more chronic nature may require 5-8 (or more) treatments. Some conditions may require ongoing periodic laser treatments to control pain.